We are pleased to confirm that Infor are committing to Blythe Valley park for a further 10 years in One Central Boulevard HQ offices, which are currently undergoing a £5 million refurbishment. One of the world’s largest providers of business enterprise software has signed up for another decade at IM Properties’ (IMP) Blythe Valley Park. Infor has been at the 247-acre business park since 2008 and decided to extend its lease by another ten years, after being impressed by the quality and scale of the £5m refurbishment at the park’s One Central Boulevard office scheme. The New York-headquartered business, which has some 74,000 customers in almost 200 countries, occupies 35,585 sq ft of space, where it employs around 250 software developers and finance teams. 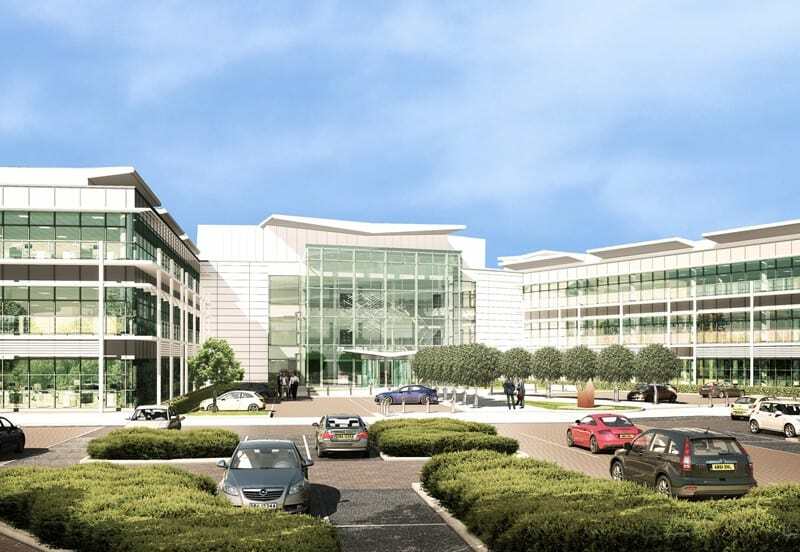 The news comes less than two months after Zenith, the UK’s largest independent leasing, fleet management and vehicle outsourcing specialist, also extended its One Central Boulevard lease by ten years, and upped its office space to 20,635 sq ft.
IMP’s asset manager, Rob Hemus, believes the two deals reflect the success of IMP’s strategy since acquiring Blythe Valley Park in 2014, in an off-market deal for around £125m. “We were confident that we could attract new tenants here for ‘design and build’ schemes, because it’s a great location in terms of connectivity, environment and facilities,” he recalled. “However, we also knew we had to get control and invest a significant amount to bring the existing space up to the highest contemporary standards. “Right from the start, our in-house team and our agents, the Birmingham offices of CBRE and Savills, have been working very closely with all tenants to understand their future needs as organisations, and as employers, to ensure we could meet those requirements. Infor specialises in industry-specific application software suites designed for the cloud. Automotive, food and beverage, and industrial manufacturing are among its most successful niches, which dovetails perfectly with the powerful presence of those sectors throughout the Midlands region. The group’s regional facilities manager, Andrea Masters, was understandably delighted that negotiations had been successfully completed. “The Blythe location is a key UK regional office, and also crucial to the smooth running of our operations throughout Europe, because our shared service centre at One Central Boulevard in the hub which controls all our European finance operations too.” she said. “So far, 2016 has been a very successful time for us. We’ve completed several big contract signings, one of which is a very famous British motoring marque, Triumph Motorcycles. “They’ve chosen us as their IT partner to deliver a global transformation of their business systems, and our automotive suite of applications will ultimately support around 1,600 users across 24 countries. With those deals completed, IMP is already looking ahead to the next phase of Blythe’s investment programme. “The final 60,000 sq ft of space at One Central Boulevard will come on stream between now and early in 2017, said Rob.